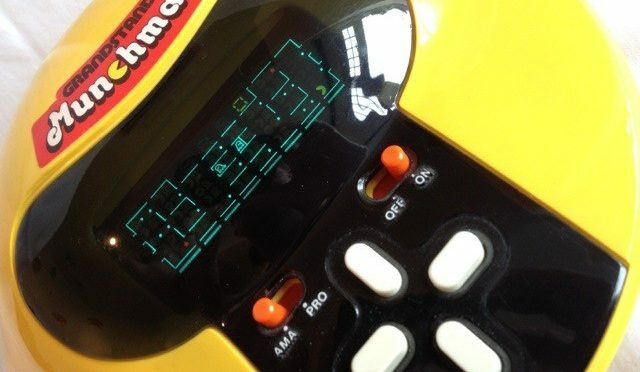 Grandstand Munchman Handheld Game Review - RetroGamesNow! Anyone who has read my blog before knows I am a big fan of retro handheld games, and Grandstand made some of the best. Many of these games attempted to recreate the big arcade games of the time, which explains the proliferation of space invader clones, including the likes of Galaxy Invader and Astro Wars. The Space Invaders game format translated relatively well to the VFD handheld games, due to the relatively simplistic graphics, and that fact that the invaders and the player character didnt occupy the same space on the game screen. When it comes to replicating a maze game, and of course we are talking about Pac Man, the graphical challenge is much greater using a VFD screen. As well as having to create a realistic looking maze, you also have a playfield that requires the player character, the enemy ghosts and also the pac pills to be represented in the maze at the same time.Grandstand managed to achieve this with the classic Munchman, delivering a great Pac Man clone that stays true to original despite the limitations of the format. The game itself is large and round, like a dinner plate, in a bright shiny yellow, a clear reference to it’s Pac Man heritage. Rather than using a joystick, which would have stood out against the smooth surface of the game, 4 directional buttons were used to control your Munchman. The only other switches are the on / off switch, and a difficulty selector that dicates the speed of the chasing ghosts. The gameplay is as you would expect, albeit with a smaller maze and fewer ghosts, with the objective being to clear the maze of pills before being caught by the chasing spooks. Eating a red power pill would make the ghosts flash, and allow you to eat them for bonus points. The one thing that does however stand put about the gameplay is that your Munchman always faces to the left, regardless of which direction he is travelling, and can only eat going left, resulting in some back tracking needed to eat all the pills. Helpfully there is still a short cut, so you can continuously travel right to left and reappear on the other side of the maze. To accompany the gampelay there is a great soundtrack, typically loud as all Grandstand games tended to be, with jaunty intro tunes and in game effects. 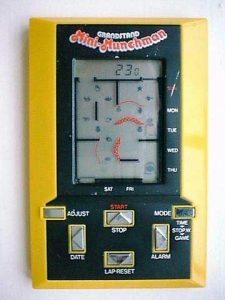 Much like the Grandstand Scramble handheld, Munchman also had a smaller LCD based sister, predictably titled Mini Munchman, which aped the yellow case if not the classic round shape. Both games were very popular, and due to the rock solid build quaility can still be found in working order on ebay. In fact its difficult to believe these games are 30 years old, and can still be played today. A “must have” for any retro handheld collector. Previous PostYie Ar Kung Fu for the ZX SpectrumNext PostMAME Cabinet Project Update – It’s Alive!